I have several posts to write about our trip out west in June, but between my full time work and making sure the kids are squared away this summer, I’ve been quite slow. Feel free to browse these Grand Canyon photo albums and at the end of this post I’ll attach the text of the post I wrote for GeekMom about the Grand Canyon, which has a little of everything but not quite so much detail. This isn’t going to be what you think. You might be thinking, “Wait a second, my geeky family goes to Comic-Con or E3 for a vacation…” Well, we’ve done things like that and it’s always great to do so. However, this summer, we elected to partake in some science geekery. Our family geeks out over geology. Since the Air Force sent our family to live in the Rocky Mountains, it’s been wonderful showing our sons the amazing things our earth is capable of producing: canyons, mesa, buttes, sand dunes, fossils, and fantastic colors. I want to share some of the educational gems we were able to share with our sons, all the while getting in plenty of exercise and sunshine. I’m thrilled that my sons were old enough to do some moderate-intensity hiking. We spent two full days at the Grand Canyon’s South Rim and did some fantastic morning hikes both days. The first day we participated in a Junior Ranger hike program at the Hermit Trail, whose trailhead is at the far western edge of the South Rim part of the park. I’ll speak more of the Junior Ranger program in the next section. This is probably the most challenging of the three main “below the rim” trails on the South Rim; the Hermit Trail is unmaintained and very rocky. The trail was maintained for several decades by the Atchison, Topeka, and Santa Fe railroad to serve rail customers with a luxurious Hermit Camp below the rim. On the Ranger-led hike, we explored the top two layers of the canyon: the Kaibab formation and Toroweap formation. On the second day, we tackled the Bright Angel Trail, which is much more crowded because of the trailhead’s easy access from the more populated parts of the South Rim park. This trail is much easier on the kids, but with the same magnificent views of the canyon. This was a great time to talk to our sons about the geological layers and we had them set a goal of how many layers we should descend. Our oldest son wanted to get down to the Hermit Shale, the deep rust-colored layer of rock. I wasn’t as nervous about my sons on the rim as I thought I would be. My oldest son would occasionally purposefully kick a clump of rocks over the edge, for which I would scold him for disrespecting the terrain. Otherwise, my boys kept aware and maintained a safe distance from the very edge. This is Ranger Alex of Ohio, who led the Junior Rangers down the Hermit Trail. To earn the Junior Ranger badge, kids need to attend one Ranger-led program. There were about a half dozen choices daily. Photo: Patricia Vollmer. Hike the challenging Hermit Trail, and enjoy the canyon’s wonders while learning about rocks, fossils, plants, and animals. Bring water, salty snacks, sunscreen, and wear sturdy hiking shoes. To arrive on time, board the free Hermits Rest Route shuttle bus by 8 am. Steep, rocky, strenuous hike not recommended for people with heart or respiratory problems, difficulty walking, or an extreme fear of heights. This sounded great to me! Let’s get some exercise and learn about the canyon too! The Hermit Trailhead is accessible only via a 45-minute shuttle bus ride to the far western edge of the “civilization” part of the park. Park guests can go further west than that, but they need to register as a backcountry hiker first. Ranger Alex was our fearless leader and was an outstanding host, taking the kids’ wide range of ages into account and making numerous stops to rest and eat snacks. He had Junior Ranger workbooks and pencils for everyone interested. The workbooks have activities for a variety of ages, from preschool to older elementary school-aged children. Alex spent individual time with the curious kids as he discussed the rock formations, plant and animal life, and the endless fossils waiting to be discovered. Once the child participates in one ranger-led program and completes the age-appropriate activities in the workbook, he/she then visits the Visitor Center where a park ranger will check work and administer an oath to the child, where he/she will vow to be a good steward of the land and respect wildlife. Our 9-year-old receiving the Junior Ranger oath at the Grand Canyon Visitor Center. Photo: Patricia Vollmer. Our new Junior Ranger showing off his badge. Photo: Patricia Vollmer. The Junior Ranger program is fun and inspirational. It’s ideal for children ages 12 and under. Hello Mr. Elk! This one was grazing in the tent site adjacent to ours at the Mather Campground at Grand Canyon National Park. We enjoyed observing it quietly for about 20 minutes. Photo: Patricia Vollmer. We elected to camp at the park during our visit, mainly because the lodging was full when we started to make the arrangements for the trip back in March. We had a great stay at the campsite, with quick and easy access to the shuttle bus stops and other amenities. He likes to eat leaves. His antlers kept getting tangled in the brush. He has antlers, so it must be a male. Observation—and patience in observation—is important in developing good science. Relaxing on the front porch of the El Tovar. You can get a sense of the native-influenced architecture. Photo: Patricia Vollmer. There isn’t only natural history at the Grand Canyon. The national park is 95 years old, and is full of great American history to teach to the kids. Before the Grand Canyon became a national park, it was a resort area served by the Atchison, Topeka, and Santa Fe railroad. The railroad built the luxurious El Tovar Hotel out of native materials and opened it to the public in January 1905. The Fred Harvey Company ran the hotel, providing luxury accommodation and meals to travelers. You might know of Fred Harvey’s legacy through the 1946 film, The Harvey Girls. The hotel is gorgeous on the interior, and there’s a history room that features artifacts over its century-long life. My oldest son was particularly interested in the El Tovar’s history, perhaps because he could use the information for a Boy Scout merit badge where he had to seek information about a National Historic Landmark. Unfortunately, we didn’t eat or stay at the hotel, but we did enjoy the lobby and front porch. The Grand Canyon at sunset is a must-see for visitors at the park. You can discuss with kids why the Arizona atmosphere can display such brilliant colors. By the way, can you see the two human silhouettes just left of the center of the photo? Photo: Patricia Vollmer. 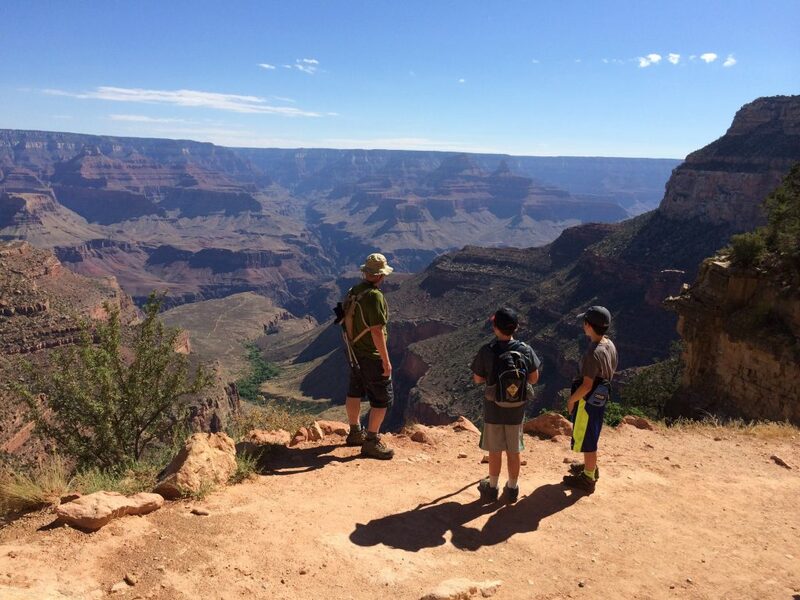 As you can see, a Grand Canyon visit is not only beautiful and active, but it can be a place where you can impart knowledge on your kids at every turn.